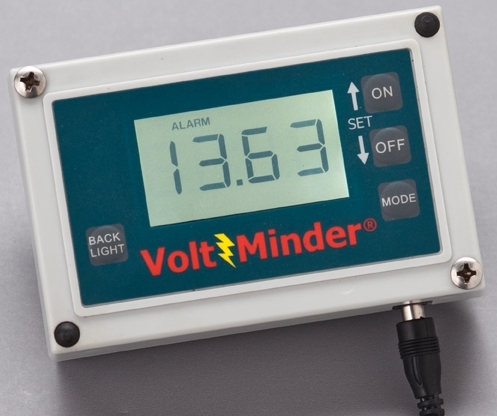 VoltMinder is a precision built electronics instrument which measures DC (direct current) voltage. Why do I need VoltMinder? If you operate a vehicle that uses a 12- to 50-volt DC battery system, you can benefit from installing VoltMinder. When correctly used, VoltMinder will insure that you never experience the disaster of a dead battery (unless the battery malfunctions internally). How much power does VoltMinder itself draw? When on, the VoltMinder will draw 28-32 milliamps. Normal draw is 28 milliamps, but when the alarm is sounding, the VoltMinder will draw 32 milliamps. How will VoltMinder make my battery last longer? VoltMinder helps avoid the damaging drain on your battery that results from usage or undercharging, thereby extending the life of your expensive battery to it's full potential. Is VoltMinder easy to use? It's easier than falling off a log! In just a few minutes, the easy-to-understand instructions will guide you through the set up process. Is VoltMinder proven in “real life” usage? Yes! VoltMinder has been in field testing for thousands of hours without a single failure. Yes, when you properly use VoltMinder, you will eliminate the cost of frequent battery replacement and costly roadside assistance (jumpstarts) due to undercharged batteries. Owning VoltMinder will be one of the best investments you can make in your vehicle. The original VoltMinder was developed in late 2001. Gary Latinis, an over-the-road trucker who has been trucking for 30+ years and driven over 4 million miles, invented VoltMinder, after realizing that there was not a simple-to-use, inexpensive device to warn a vehicle operator that the battery voltage was dropping to a level that would not allow the vehicle to start. Before inventing VoltMinder, Mr. Latinis experienced the aggravation, expense, and inconvenience of waking up and finding that his truck's battery voltage had dropped too low to start his engine. One day he decided that a trucker (or anyone who has to worry about their batteries) shouldn't have to put up with this high dollar problem. So he invented VoltMinder. He has been testing VoltMinder over the past year, without a single failure of the original device. I'm hard of hearing. Can VoltMinder audio alarm be made louder? Currently, VoltMinder audio alarm level is set at the time of manufacture. E-mail us or call us at 903-815-7561 for special orders. What information does VoltMinder digital readout provide? • How much voltage your headlights are taking from your battery. • How much voltage your trailer or cab lights take. (TIP - LEDs take much less voltage than conventional bulbs). • If some electrical equipment is pulling more power than it should (this may indicate an electrical short exists). • After you use VoltMinder for a while, you will be able to determine when your alternator is going bad. All Rights Reserved. Copyright 2018 by Voltminder, Inc.